I enjoy English Ales, so this week was pleased to find a new ale from Britain on the shelf of my local LCBO, Dark Star Brewing Sunburst Classic Golden Ale. Not only is this an English Ale but also it is from an English craft brewery in Sussex, which is in the south end of England. 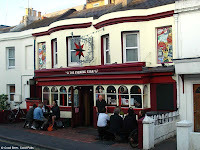 Dark Star started in the basement of the Evening Star Pub in Brighton in 1994. Popularity grew as they shipped beer to other pubs and attended many beer festivals so, as they explain in a fun way on their website "In 2001, the team emptied their piggy banks, cashed in any ISA's, sold TV's and dug around behind the sofa for loose change, to relocate the brewery to a new purpose-built, 15 brewers barrel brewery in Ansty, near Haywards Heath -some would argue this was the point the hobby started to become a proper business...some would anyway. A few years on, and once again the brewery was on the move, this time to a bigger site in Partridge Green, just south west of Horsham, West Sussex." "The name Dark Star was given to a dark strong bitter brewed by the young R ob Jones for Pitfield Brewery in London in 1987. In Rob's long-haired hippy days he named the brew after the music of The Grateful Dead although years later he still unashamedly takes the credit for the perfect assonance and eerie oxymoron within the name. The beer went on to be Champion Beer of Britain and then later the 25 year Champion of Champions." Note: I learned a new word in researching this brewery. Assonance! Sounds like a success story. As the name implies it does pour golden in colour with a nice white head. There are lots of lacings which line the side of the glass while I sip away. Now what is called a g olden ale in England is known as a Blonde ale here in North America. Like a blonde ale this ale is not too hoppy and lighter in taste. I am not a big fan of Blondes but this one is OK. There is a slightly hoppy finish which is lacking from the North American versions I have tried. It is refreshing and I will have no problem in drinking the other. Although not a great fan of this beer, I would love to try others from this brewery.